THE problem at the AU summit in Addis Ababa last week began when the UN Secretary-General, Ban Ki-Moon, took to the podium and, like a school head teacher, accused African leaders of bad governance and undemocratic practices, singling a few for praise. “Leaders should not use undemocratic constitutional changes and legal loopholes to cling to power. Leaders must protect their people, not themselves,” he lectured. It was not difficult to guess the leaders he meant. He was so authoritarian and swashbuckling you couldn’t believe it was the same man who cringes at the sight of the Americans and the Europeans at the United Nations. He praised President Alpha Conde of Guinea, President Ellen Sirleaf Johnson of Liberia, President Ernest Bai Koroma of Sierra Leone and Bishop Desmond Tutu of South Africa. That is how the problem began. So that by the time President Robert Mugabe, the outgoing chairman of the AU took to the same podium to deliver his farewell message, he put aside his prepared speech and for 20 minutes, spoke directly to the UN Secretary- General a few metres away from him. “It’s a pity I speak immediately after the Palestinian leader, Mahmoud Abbas because he represents a problem the UN has failed to resolve for decades. How long will the UN stand idle while Israel demolishes Palestinian homes and builds houses for its citizens on the rubble?” he asked the secretary-general. Then he lambasted the undemocratic nature of the UN and how that has to change. He lamented the routine pilgrimages to New York each September to deliver hollow speeches in the General Assembly that no one listens to because decisions are made by the five members in the UN Security Council. He decried the hopeless position of the African because the whiteman deems him inferior. He warned if that is not changed and Africa given a permanent seat in the Security Council, they may pull out of the UN. “Go and tell them that,” he challenged Ban Ki Moon, who kept holding his head down. The summit responded with an ovation that rose and rose, rising to the roof of the conference center. Someone in the gallery screamed. President Yahya Jammeh of Gambia, unmistakable in his trademark white flowing gown and matching turban stood up clapping his hands. Then Paul Kagame of Rwanda followed, then Mahommed Buhari of Nigeria, then they all stood up. Later, everyone would agree it was an unprecedented historical moment. Jacob Zuma looked around and hesitated; you saw it in the way he looked around and the cumbersome manner in which he eventually rose. Robert Mugabe was writing his own bit of African history. Yet he had not even started giving the grim details of the African story. He began with the horrible story of the slave trade when millions of Africans were shipped across the Atlantic to America to work in their sugar and tobacco plantations. That humiliation was followed by the colonisation of the continent until we had to take up arms to fight for our freedom and independence. He remembered how Charles de Gaulle refused to grant Algeria independence because, he argued, it was part of France. There was a bloody 10-year war from 1954 to 1962 that claimed the lives of more than 300 000. Franz Fanon, a medical doctor who treated the wounded in that war would chronicle his ghastly experience into a historic book on the plight of the oppressed, The Wretched of the Earth. Robert Mugabe remembered Ben Bella, the leader of that revolution and his enduring words at the formation of the OAU in Addis Ababa in 1963: “We must all die a little for people in apartheid South Africa to be free”. The sentiment constituted the bedrock upon which the philosophy of pan-Africanism was founded. I looked down at Jacob Zuma from the gallery. He fiddled with a sheaf of papers on the desk in front of him. Perhaps he had been reminded of the xenophobic attacks that swept across his country in 2013 and left many fellow Africans dead. It was perplexing how South Africans forgot the sacrifices Africa made so that they could be free. Robert Mugabe remembered Julius Nyerere and how he set up the liberation committee to help liberate Southern Africa, how all the liberation movements were offered military training facilities in the country. He remembered Nigeria and the difficulty it faced to pay its obligation to the OAU because of the war in Biafra at the end of the 1960s. And once the war was over, how Nigeria paid its arrears of seven million pounds in a single staggering lump. He remembered Kwame Nkrumah, Africa’s inspiration. He also remembered how every country in Africa was once a colony and how they fought to be free. A woman from Eritrea sitting next to me in the gallery whispered: “He is a legend!” There were tears in her eyes. And when I told her later that I came from Zimbabwe, she looked at me with disbelief. “You are from there? You don’t know what you have,” she said rubbing tears from her eyes. Ban Ki-Moon forced a smile but kept holding his head down. You wondered whether he understood what Robert Mugabe was saying. If he did, as we say in Shona, he must have wished the floor swallowed him. 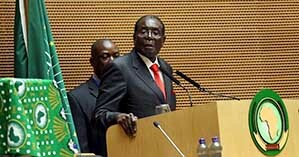 At the summit, Robert Mugabe was the voice of Africa. He raised the meaning of being African to a new level by defining an African who was not confined to colonial borders. “I am an African and I belong anywhere in Africa,” he said. It was evident at the summit Africa listens and believes in voices similar to Robert Mugabe’s voice, the voice of the founding fathers. He told the African story. His leadership left an indelible mark on the African political landscape. In his acceptance speech, the incoming AU chairman, President Idriss Deby of Chad admitted it was a daunting task to come after someone like Robert Mugabe because of the high benchmarks he had left. And yet Robert Mugabe’s own story has not been told. There has been a spirited attempt by outsiders, especially our former colonisers to tell it. Their stories are driven by a dark desire to demonise his monumental African legacy. The British will dismiss any attempt by an outsider to tell Winston Churchill’s story; that is indisputable. We have to tell Robert Mugabe’s story. And when at last he went to his prepared speech, back to programmes and strategies to fulfil Agenda 2063, he had already bared his soul. He is an African hero. And just why do African leaders find the lure of US hegemony so attractive they’re seem prepared for whatever sacrifice is needed in its pursuit? Africa should be rich but it isn’t. Africa needs to be united to achieve this but it doesn’t seem so.